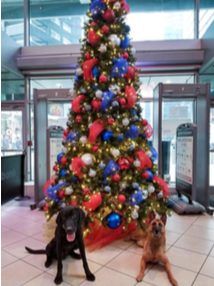 The Canine Unit has been busy with the increased holiday traffic and special events taking place with both Pearson Airport and Commercial Divisions. The Commercial Division has provided EDD coverage for some special events, including visits from Bill and Hillary Clinton, and several Cirque du Soleil shows, in addition to the busy concert and Leafs/Raptors schedules. The Pearson Airport Team has managed the increased volume of unattended bags and suspicious items that come with the busy time of year, with the added responsibility of being primary response to these calls for service. Members of the team met recently with the St. John’s Ambulance therapy dog team to welcome them to Pearson Airport and to tell them about our duties and responsibilities for providing explosives detection canines to the GTAA. The meeting went very well and we look forward to seeing the therapy dogs doing their important work in the new year. Members of A.S.P. Canine from both divisions are continuing to work with Transport Canada in the development of national standards for the EDD screening of air cargo, with two visits to Ottawa to work dogs in trials designed to test their processes and procedures. The A.S.P. Canine teams are representing A.S.P. very well in Ottawa and are continuing to perform an important service to the development on these national standards. The Canine Unit members extend season’s greetings and best wishes in the New Year to all of the A.S.P. team and their families.